We have been asked to give some pointers with regards to scalping the markets, what to look for, when to get in, out, games to try it with and so on. 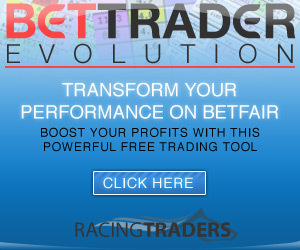 Firstly for scalping purposes the use of a dedicated software is a must if you intend on scalping on a regular basis. We will be reviewing the various software offerings in the coming weeks, so watch this space. So which markets are the best to scalp? The under 1.5 is a personal fave for scalping. On an average game the under 1.5 price will be around 3.6 to back. By half time this price will halve if the score is 0-0, in fact the under 1.5 will be the same, (or near as) at half time as the starting price of the under 2.5. So let’s consider this………..if it starts at 3.6 then it will drop around 40 ticks per 10 mins on average to reach it’s 1.8 at half time. So how is the best way to use this information? The following are % of goals scored in the first 15 minutes this season. So we’re looking on average around 12.5% there will be a goal in the first 15 minutes which equates to 1 game in 8.…………Which is pretty good in our favour! What else helps with scalping? Live games that you are watching are a must! Trading blind is far too dangerous. How do you know where the ball is? How do you know what is happening in the game? Have there been many chances? To trade blindly really should be avoided. Even streamed matches have various delays of 10 seconds to 3 minutes…………. An example was an African Nations game and the game was about 5 minutes old and score was still 0-0. The price on the under 1.5 was 3.20. A back was submitted at 3.20 which was quickly matched and the lay was instantly put on at 3.10, 2 ticks lower. This was taken within 30 seconds at a point of the game where the ball was in the goalkeepers hands and was safe. There was very little money in the queue so the lay bet was going to be taken quickly as it was at the front of the queue. Then resubmitted at 3.05 to back after spotting very little money below this and big gaps in the market. Once taken the lay side again was submitted at 2.94 and taken within a minute. Lastly the price from 2.90 to 2.54 took about 45 seconds and I was in there for that as well. First 15 minutes are safest. Look for the gaps, try for better prices and once bet taken instantly resubmit on lay side 2 or 3 ticks lower. When the price is over 3 the drops are in .5s so using £50 stakes you will make £2.50 per tick made or £1 for £20 stakes which is 2.5 times better than when the price drops below 3s. IF you do get caught you’re not totally out of it as 2 goals are needed for you to lose your stake unlike scalping the current correct score where a goal will lose your entire stake. IF this happens choices are to trade out for a loss when market settles or back bigger scores leaving it open or lastly waiting for it to drop before laying off for a smaller loss………..
By being at the front of the queue you will be matched quicker. Whilst liquidity is important in any market, gaps and bets matched quickly happens a lot more regularly for the under 1.5. A safer method where a goal won’t be as costly but the drops of course will not be as quick. In the first 10 minutes of a game drops can be anything up to 25 ticks………. Gaps are not as apparent due to more liquidity and the unders scalping is a favourite for many traders. There used to be a premise where in a game where the score was 0-0 those that used a well known lay the draw trading method would be offloading around 60 to 65 minutes and the 0-0 price would drop sharply……….Whether this still holds weight is anyone’s guess although it is true that a lot of ‘draw layers’ will trade out around this period and the price will come crashing in. Something to look out for, but again live pictures with a feel for the game is recommended. This can pay handsome dividends, more so when the price is over 10s and a £20 back and lay 1 tick profit will give you £10 green on the 0-0 scoreline. Scalping early on into a game is recommended for this reason as well as mentioned above, ie the lack of goals being scored in this timeframe………..But of course getting caught on 0-0 will lose your stakes. Perhaps consider using it with a back on the 2-0 and 0-2 scorelines to give you some insurance in case of a goal. Scalping is a great way of giving profits or using it as insurance on another trade within that game. If you’re new to scalping try smaller stakes and learn to nip in and out, try and get in and out asap. Less time you’re in less risk of being caught. Make sure you have one eye on the tv so you know where the ball is in play. Look for the gaps and where the amounts are small. Soon as your back bet is taken submit on lay side straight away. Being at the front of the queue means less time and less risk with an open trade. Using a laddered software is a MUST.